Distinguished Professor Dame Anne Salmond University of Auckland. 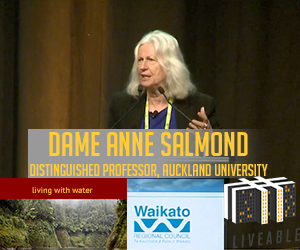 Dame Anne Salmond will discuss Maori and modernist ideas about fresh water, and how we might creatively bring together aspects of the common law and Maori understandings in governing waterways across New Zealand. Dame Anne Salmond is a Distinguished Professor in Maori Studies and Anthropology at the University of Auckland. In 2013 she won the Rutherford Medal, New Zealand’s top scientific award and became the New Zealander of the Year. She is a Foreign Associate of the National Academy of Sciences in the US, Corresponding Fellow of the British Academy, and Foreign Member of the American Philosophical Society. As part of her scholarly work, Dame Anne has developed a strong interest in Enlightenment natural history and Maori and Pacific philosophies relating to land and sea, bringing these together with aspects of cutting edge science to reflect upon environmental questions.